The Integrated Atmospheric Characterization System pictured in its initial test location at Naval Base Ventura County, Point Mugu, Calif. IACS is a land-based survey tool that measures complex weather features and conditions that might affect laser propagation, such as optical turbulence, transmissivity, and water vapor levels. 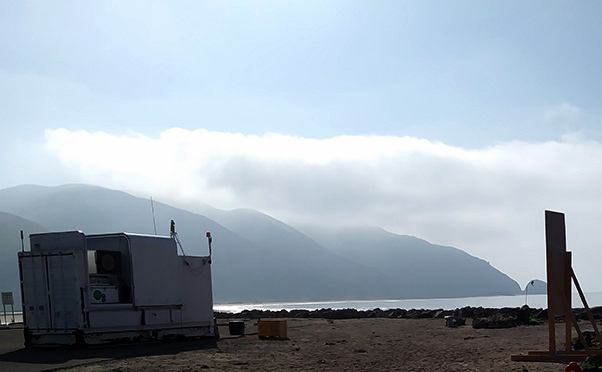 This summer, the Point Mugu Sea Range off the coast of Southern California adopted a new directed energy test atmospherics-based system that might be a game-changer in their ability to measure and predict weather conditions on the range, a critical factor in supporting the test and development of weapons systems. The Integrated Atmospheric Characterization System is a land-based survey tool that measures complex weather features and conditions that might affect laser propagation, such as optical turbulence, transmissivity, and water vapor levels. IACS uses two light detection and ranging, or LIDAR, systems to help measure and characterize atmospheric conditions. It can also determine boundary heights, and acts as a “super ceilometer,” providing finely resolved cloud base height and tilt measurements for test engineers and operators. 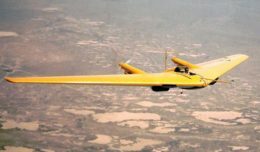 “Many programs are concerned about visibility through haze; IACS will be able to derive absolute extinction values for multiple kilometers,” said Roberto Garcia, head of the Range Geophysics Branch in Point Mugu, Calif., whose team acquired and operates the system. LIDAR uses pulsed laser light to detect range and is often used in digital mapping. In IACS, the LIDAR is, in a sense, helping map weather conditions. “Traditionally, systems used to measure this kind of data need to have a source of light, a beacon, transmitting from the needed range back to the receiver,” said Kyle Edwards, a weather forecaster with Range Geophysics and a member of the IACS integration team. That system works well when the end point is an island or other fixed point, but if you’re looking for data out over the ocean, beacons become less useful,” he added. The IACS system has both transmit and receive LIDARs co-aligned on a single mount, essentially functioning like a radar, transmitting light instead of radio waves. The beaconless measurement process saves time and money while actually increasing the amount and accuracy of atmospheric data available. Capable of sweeping a “slice” of the atmosphere from 10 degrees below the horizon up through the zenith, the system provides PMSR with a persistent capability to test, evaluate, and upgrade instruments built for optical systems and others impacted by the atmospheric conditions unique to the maritime environment. IACS was first developed by the Department of Defense Test Resource Management Center, and the Naval Air Warfare Center was the first request custody. A team from the Geophysics Branch travelled to the Georgia Tech Research Institute and Cape Canaveral to learn how the machine operates, then to disassemble it for transport back to Point Mugu. Getting the IACS in place and operating was a bumpy road, sometimes literally; the system arrived in need of repairs and recalibration caused during transport, requiring representatives from Georgia Tech to come out to conduct repairs and help with recalibration. There were also a slew of permissions, safety plans, and clearances necessary before the team could actually “light” the system. “Learning how to operate a complex, pointable laser was challenging enough,” Garcia said, “but there were many logistics components and approvals required to operate at the Point Mugu Sea Range.” Safety plans, site approvals, and permission from the Laser Clearing House had to be in place. In all, the team estimates they’ve spent more than 800 hours working on the project at PMSR alone. Luckily, the IACS team had a lot of help. Later this year, IACS will be partnered with the High Altitude Atmospheric Sensing (HALAS) system. HALAS, developed by Michigan Aerospace Corporation, is a long-range wind, density, and temperature measurement instrument capable of providing a critical real-time meteorological assessment of the troposphere and stratosphere. It is composed of an ultraviolet-based direct detection LIDAR system for wind velocity and direction, density and temperature measurements, combined with a Raman channel to measure nitrogen and oxygen concentration. According to Garcia, the combination of IACS and HALAS will provide an unsurpassed venue for evaluating emerging technologies as well as test and evaluation instrumentation. “PMSR will be able to gather a wealth of field data and validation capability for the next generation of turbulence profile models,” he said.